Along the Gold Coast in Ghana, going back centuries, the structure of local civilization consisted of many small, fiercely independent, militaristic groups of Fante people, who have survived and held their ground throughout British Colonial rule. These small warrior societies are known as Asafo Companies, and according to some accounts their existence dates back to the 15th Century. Until the end of the British occupation in 1957, the main purpose of these companies was military in nature. This is still true today, although the companies also act social structures and communities beyond military purposes. 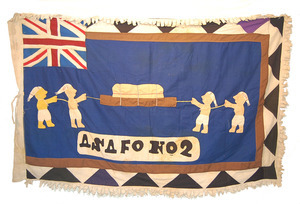 Asafo flags were and are an extremely important form of military, political, and artistic expression and are highly valued by their companies, kept secure and revealed only in public military ceremonies. At these ceremonies, Asafo companies parade through the streets, while the flags are presented by specially trained dancers, called frankaakitsanyi. The dancer’s movements mimic battle scenes, while actors armed with muskets protect the flags. These actors are called asikamafu, guardians of the flag. The imagery on each flag asserts the wealth, might, and fighting prowess of its company, and explicitly challenges and mocks rival companies. As you will see in the examples below, insults and boasts are the norm in Asafo flag design, and the flags call on a rich tapestry of African proverbs and animal imagery as a means of intimidating one’s enemies. 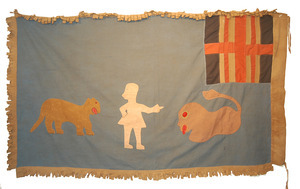 Considering these flags’ unique combination powerful and lyrical iconography, it is surprising how long it has taken for collectors outside of Africa to see their value, but they have finally been recognized by museums and collectors worldwide. 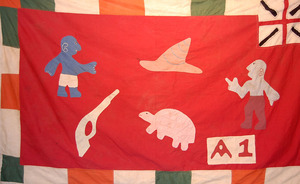 The pieces in the Art for Eternity Asafo flag collection are select group of flags from the collection of Mr. and Mrs. Paul Peter and Mary Sue Rosen. The Rosens have curated nine exhibitions of Asafo Flags in New York, Philadelphia, and New Jersey, including an exhibit at the African Art Museum of the Society of the African Missions in New Jersey. Pieces from their collection can be seen in the Newark Museum, the SMA Fathers African Art Museum in New Jersey, the Charles Blockson Library at Temple University in Pennsylvania, and the African American Research Library, in Florida. 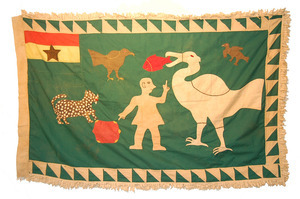 Many of these flags are published in Emblems of Power: Asafo Flags from Ghana by Mary S. and Paul P. Rosen. A member of the company has his left hand in a boiling pot representing a rival company. 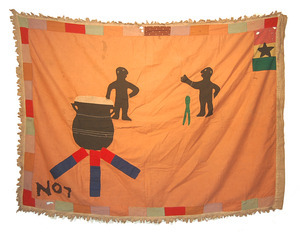 With this image, the No.7 Company taunts a rival company, saying “you may be tough, but you can’t hurt us.” The canton is a replica of the Ghana national flag. Cotton textile, with hand-sewn figures and embroidered details. Identical images on both sides. 52” x 38”. The message is, “we come in peace, like the tortoise and the snail—but do not be fooled, for we are able to defend ourselves.” This flag suggests to rival companies that if they behave as peacefully as the tortoise and snail, there will not be any warfare. Cotton textile. 60.5” x 38” inches. The implied message is that even lions recognize the strength of the company that owns this flag, and that a rival company (represented by a spotless leopard) has no chance of winning if it starts a fight. 60” x 35.5”. No. 2 Company - cooperating in moving a load. Highly detailed embroidery, stylized font, rich colors make this a uniquely beautiful example. 38” x 66”. This image serves as a reference to the extraordinary powers of the company, it directly contradicts nature - birds naturally swallow fish head first to avoid the fish’s spine. 35” x 54”.